Into the WINTER 017 Collection we have two different Long Sleeves Jerseys, “ARROWIND”, Man and Woman, and “SUPER ROUBAIX”, Man. 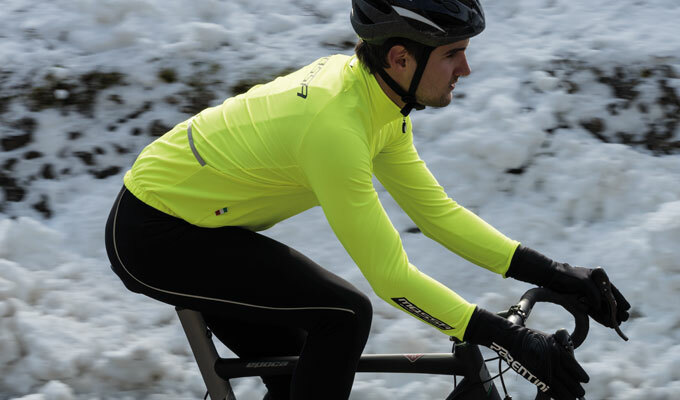 “ARROWIND” LS Jersey, MICROFIBER MULTIBAVA Polyamide, with a teaseling inside, for a better BREATHABILITY, the maximum LIGHTNESS, and a better COMFORT, with a temperature as low as 10/13 °C. with specific WINDPROOF characteristics. ARROWIND is a brand new non-run, elastic fabric, developed in Italy with the new textile technology called FLAPTEX. This technology allows ARROWIND to join all the best technical characteristic of a non-run, elastic fabric (breathability, elasticity, pleasantness) to a specific function of reduced air permeability (air passage). Arrowind guarantees You a comfort level and a well-being sensation never reached with one singular fabric, until now possible exclusively with a combination of technology and different elements – not only textile. “SUPER ROUBAIX” LS Jersey, MICROFIBER MULTIBAVA Polyamide, with a teaseling inside, for a better BREATHABILITY, the maximum LIGHTNESS, and a better COMFORT, with a temperature as low as 10/13 °C. All the Short Sleeves Jerseys are realized with special patterns to obtain the best fitting and an optimum movement.